One of the most versatile and rewarding plants in a summer edible garden is the tomato. According to a 2014 study by the National Gardening Association, 86 percent of homes with vegetable gardens grow tomatoes. It is understandable that the tomato plant is a popular home vegetable garden staple, tomatoes offer thousands of different varieties options and flavors. Plus, nothing beats the flavor of a ripe tomato straight from the garden. When properly cared for, a single tomato plant can produce 10 to 15 pounds (4.5 to 6.8 kg) or more of fruit. 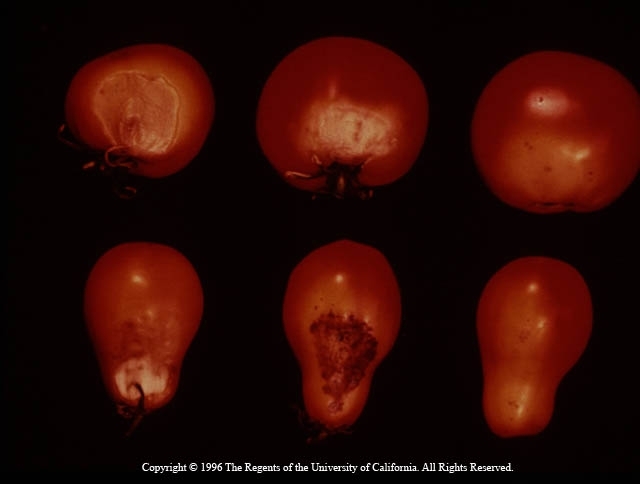 If tomato yields aren't what was expected or the fruit is damaged it could be due to a number of abiotic disorders, diseases or pests. Abiotic disorders result from nonliving causes and are oftentimes environmental, for example: unfavorable soil conditions, too much or too little water, temperature extremes, physical or chemical injuries, and other issues that can harm or kill a plant. 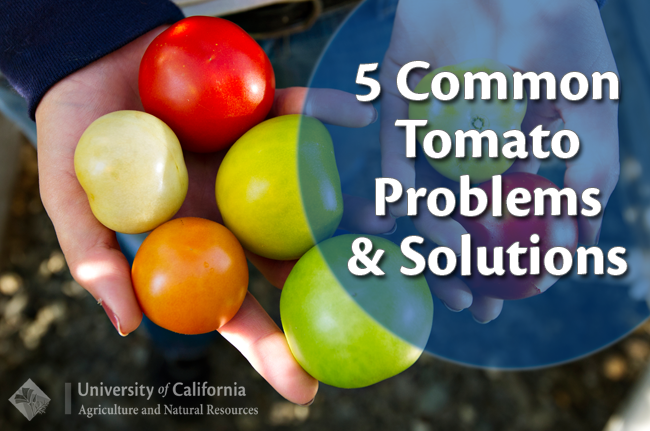 Below are five common abiotic disorders of tomatoes and recommended remedies from the UC Agriculture and Natural Resources publication, Growing Tomatoes in the Home Garden. Problem: Fruit turns light brown and leathery on side exposed to sun. • Maintain plant vigor to produce adequate leaf cover. • Provide partial shade during hours of most intense sunlight. Problem: Older leaves roll upward and inward suddenly, leaves become stiff to the touch, brittle, and leathery. • Maintain even soil moisture. • Provide shade during hours of intense sunlight. Problem: Water-soaked spot on blossom end of fruit enlarges and darkens, becomes sunken and leathery. Affects both green and ripe fruit, and is more common on sandier soils. 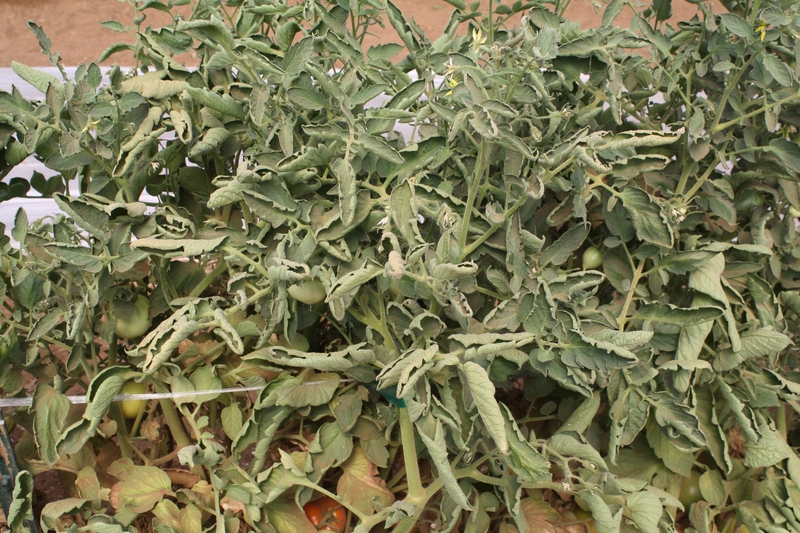 Causes: Calcium nutrition and water balance in the plant, aggravated by high soil salt content and fluctuating soil moisture. • Amend planting area with compost to improve water retention. • Avoid heavy applications of high-nitrogen fertilizer. • Soils deficient in calcium may be amended with gypsum. Problem: Circular concentric cracks around the stem end (concentric cracking), cracks radiating outward from the stem (radial cracking), malformation and cracking at the blossom end (catfacing). Causes: Very fast growth with high temperatures and high soil moisture levels. Wide fluctuation in soil moisture and or air temperature. Any disturbances to flower parts during blossoming. • Maintain good leaf cover or provide partial shade during hours of most intense sunlight. • Mulch around the plant 3 to 7 inches deep to maintain soil moisture and temperature. 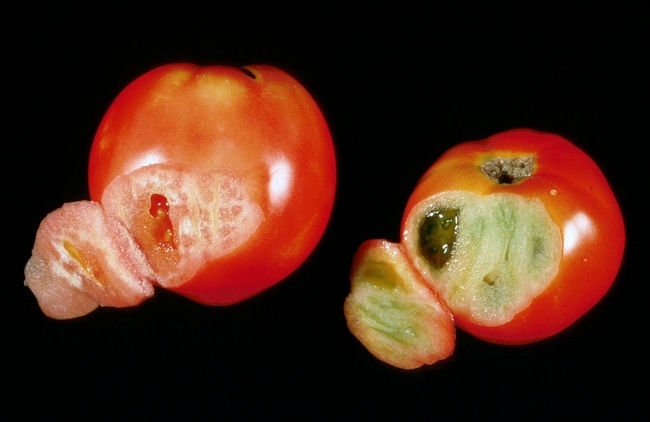 Problem: Yellow or yellow-orange instead of normal red color, upper portions of the fruit remian green even though the lower portion appears red and ripe. Cause: High temperatures and high light intensity. • Maintian plant vigor to produce adequate leaf cover. Pests eating away at your tomatotes? Other damages that are caused to tomato plants can be caused by a variety of pests. Some examples of common pests, include: hornworms, tomato fruitworms, tomato pinworms, stink bugs, white flies, and leafminers. 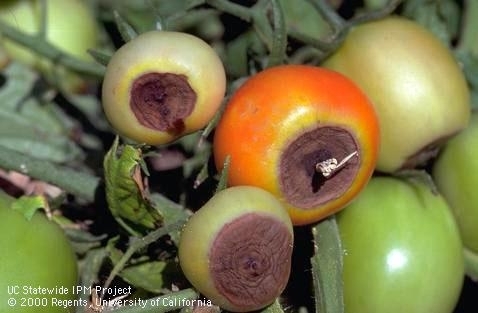 For information about identifying and managing pests in your edible garden visit the UC Integrated Pest Management (UC IPM) website, ipm.ucanr.edu. Looking for free gardening advice? Since 1981, the UC Master Gardener Program has been extending UC research based information about home horticulture, sustainable landscape, and pest management practices to the public. Through a vast network of more than 6,000 certified UC Master Gardener volunteers, the program is administered by local UC Cooperative Extension (UCCE) county offices across California. Contact the UC Master Gardener Program in your county for more information about edible gardening or upcoming educational workshops, mg.ucanr.edu. This was so helpful in analyzing my tomato problems and helping others to understand their tomato issues in this hot day year. Great stuff! Suggest consider adding it to the public website, unless it's there and I missed it. tomatoe plants have yellowing leaves with brownish grey spots what might be the problem? Great article and visuals to go with the explanations were spot on. Thanks, Lauren. This is probably the number one situation we find on our Helpline. Home gardens simply aren't performing as expected because of the So Cal drought and 106 degree heat wave. 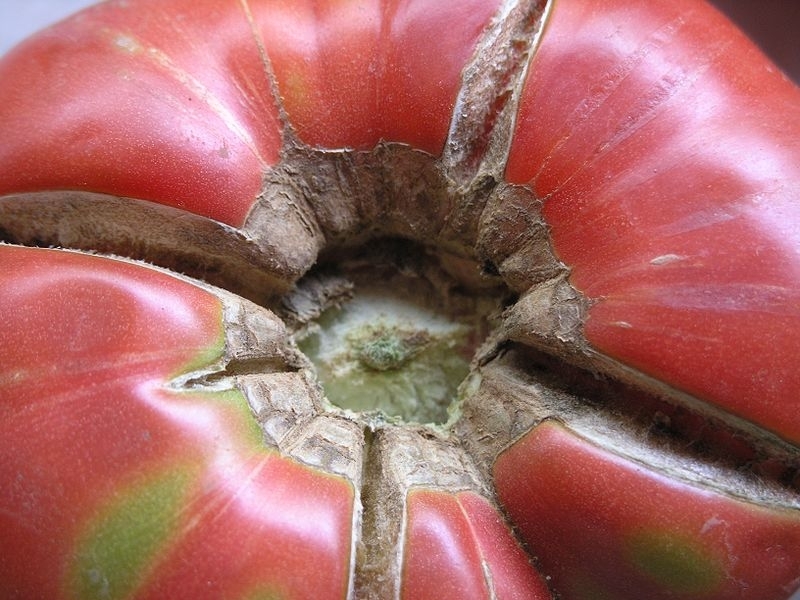 Tomatoe plants have yellowing leaves with browish grey spots what might be the problem. Janet working the help desk and cannot find a good answer?